Today at look at two ads seeking “young women of high ideals and ambition” to become telephone operators, one of the few careers open to women exclusively. First, an ad from 1911 for the Southwestern Telegraph & Telephone Company (click for larger image — transcription below). The new building is equipped with every comfort and convenience for the operators. The entire third floor is set aside to their use, and there are the cafe, the rest room and roof garden. Taken all together the building is a model, designed and planned with the one purpose: That of the helpfulness of service. Representatives of the company feel that environment has much to do with the attitude of the employees. 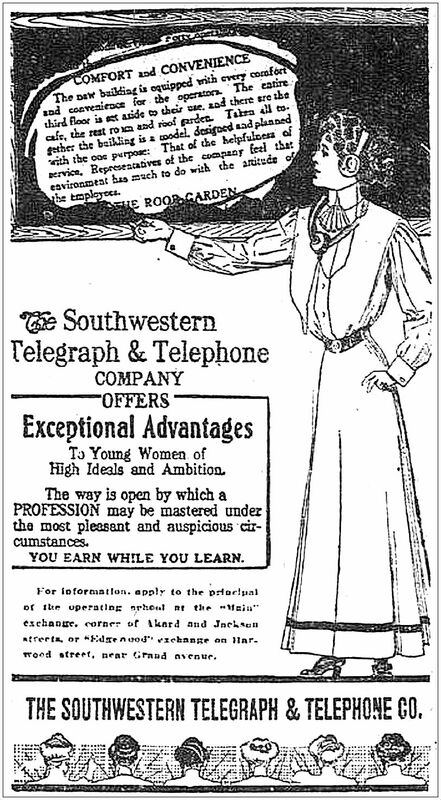 The Southwestern Telegraph & Telephone Company offers exceptional advantages to young women of high ideals and ambition. The way is open by which a PROFESSION may be mastered under the most pleasant and auspicious circumstances. You earn while you learn. For information, apply to the principal of the operating school at the “Main” exchange, corner of Akard and Jackson streets, or “Edgewood” exchange on Harwood street, near Grand avenue. Here’s an ad from 1925 for Southwestern Bell Telephone Company, really pushing the idea that working as a switchboard operator is mostly rest and “a variety of diversions — sewing, dancing [! ], reading, conversation”... more play than work, really! 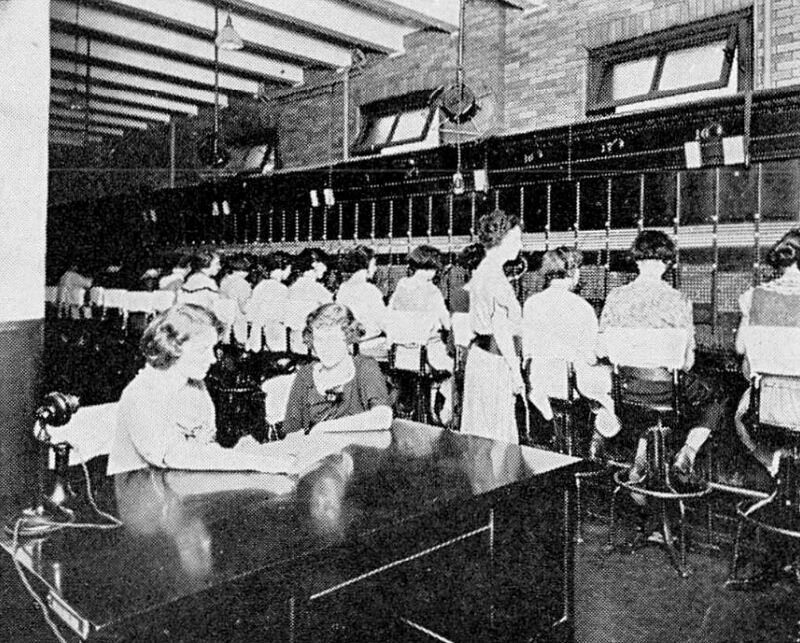 The telephone operator works between rests. 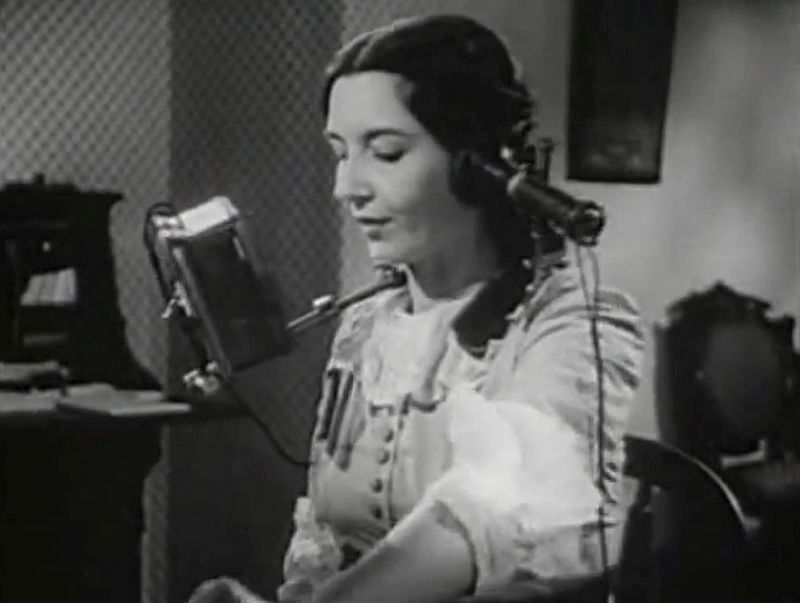 Most of the time, it is true, she sits at the switchboard putting up the talk tracks for the subscriber, but in-between-times are periods for recreation, in which she has opportunity for change and relaxation. 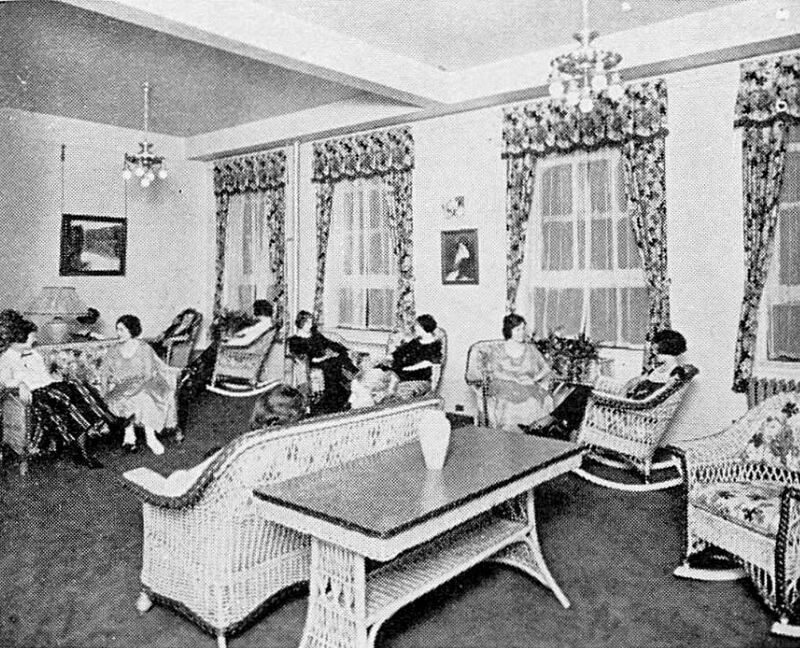 Attractive rest rooms invite a variety of diversions — sewing, dancing, reading, conversation — or just rest. Miss Etta Mooneyham, Chief Operator at the Long Distance Office, at 4100 Bryan street, will welcome your visit any afternoon from two to five o’clock. If you’re lucky, maybe Miss Mooneyham will ask you to dance. 1911 ad appeared in the Dallas Morning News on May 29, 1911; 1925 ad (containing the photos at the top and bottom) appeared in the 1925 edition of “The Oak,” the yearbook of Oak Cliff High School (later renamed Adamson High School). I’ve been fascinated by telephone operators my whole life. Ever wonder why operators have historically always been women? Watch an entertaining 5-minute video about why women took over the profession, here. 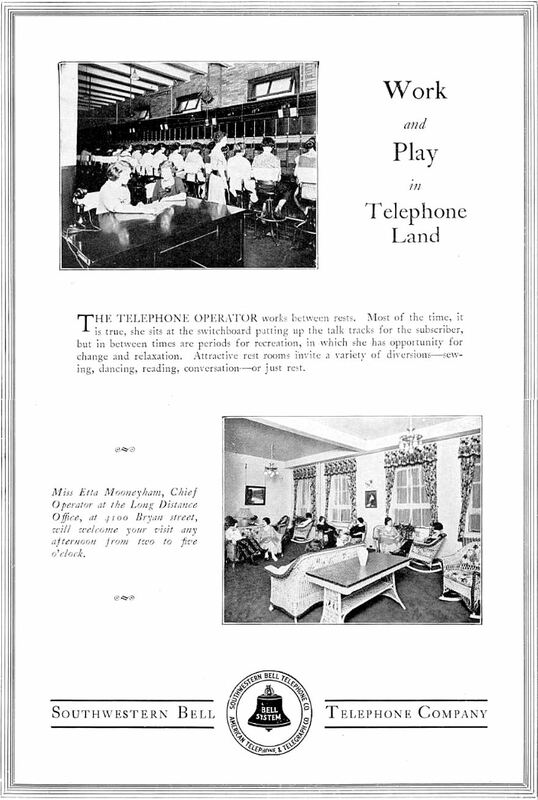 Also, read an interesting New York Times article about “telephone girls” (June 11, 1899), here. See an earlier, related post — “Telephone Operators Sweating at the Switchboard — 1951” — here.